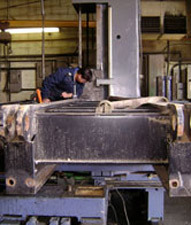 Regina Metal Industries provides machine shop services and metal fabrication services specializing in repair. Since 1997, we have been serving Saskatchewan’s repair and manufacturing needs with precise workmanship and quick turnaround times. Lathe working can be applied to many types of applications including mining, construction equipment, food processing, printing, auto, truck, and farm equipment. 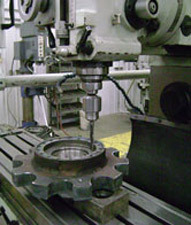 We can repair or make new shafts, bushings, bolts, nuts, retainers, flanges, rollers, etc. Some of the materials we can machine are steel, bronze, aluminum, iolite, plastic, nylon, cast iron, and stainless steel. We can also provide milling machine work in many capacities. This includes both CNC and manual machining. 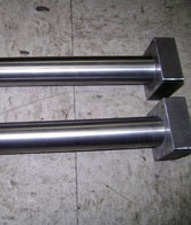 Machining slots, keyways, step keys, spline and gear cutting, drilling, boring, beveling, and line boring are a few of the services offered with our milling machine work. Our services also include drill press work. We have drill presses to accommodate jobs that require heavy to light gauge, reaming, power tapping, structural drilling, countersinking, counter boring, and drilling holes in hardened material. Regina Metal Industries also offers pipe fitting, threading, and grooving to accommodate a wide range of industrial machining needs. We can modify or drill and tap weld caps. We can machine weld bevels, machine socket weld fittings and Victaulic grooves. 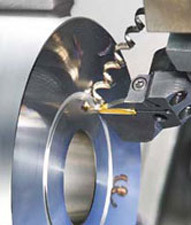 CNC machines, following a computer program, control the cutting tool speed, change tools, and perform all of the necessary cuts to create a part. 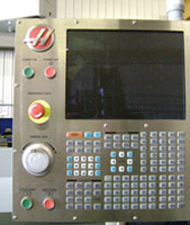 Regina Metal Industries offers both CNC turning and CNC milling. Our experienced machinists can supply custom machining, one-offs, prototypes, and short production runs.